There are certain images from the historic October of 2004 that can never be forgotten. Curt Schilling‘s bloody sock, Johnny Damon‘s grand slam, David Ortiz‘s walk-offs, Keith Foulke‘s final flip to Doug Mientkiewicz. But between those lasting impressions is one that may have made the biggest impact in ensuring those memories would be cherished, rather than reminders of more heartbreak, like so many moments of Red Sox past. The reason may be because it wasn’t a moment at all — it was a complete game. 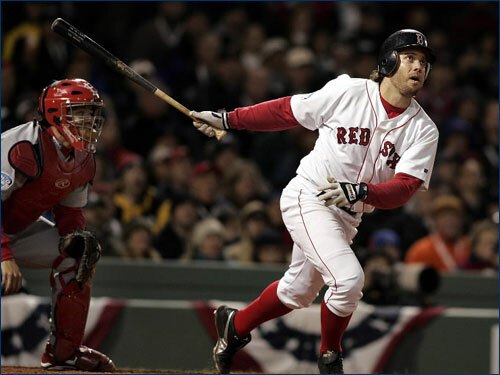 The opening game of the World Series on Oct. 23, 2004, featured the high-powered St. Louis Cardinals coming into Boston, where the Red Sox were fresh off the most unbelievable comeback in baseball history. What transpired at Fenway Park on a night when temperatures dipped into the low 40s was an instant — yet largely forgotten — classic. Both teams were victims of lengthy seven-game series, resulting in the unorthodox Game 1 pitching matchup of Tim Wakefield and Woody Williams. Neither made it through four innings, and neither was very good. Ortiz, who had already established himself as a postseason legend in the two weeks previous, stepped into the batter’s box in the bottom of the first inning and launched a bomb high over Pesky’s Pole. Whether it was fair or foul was hard to tell, but Ortiz circled the bases, giving the Red Sox a 3-0 lead in the process. The Red Sox had picked up right where they left off, and things seemed to be going according to plan. An RBI single from Bill Mueller later in the inning only drove that point home further. Shortly after, all hell broke loose. Larry Walker homered to begin his 4-for-5 night, chipping away at the lead. But the Red Sox knocked Williams out of the game in the bottom of the third. Through three frames, the Red Sox held a 7-2 lead and only needed Wakefield to get through six innings with minimal damage to guarantee a win. That much, Wakefield could not do. He walked the bases loaded in the fourth and gave up three runs, though one was due to Kevin Millar‘s inexplicable wild throw to third. After his fourth walk of the inning, Wakefield was lifted in favor of Bronson Arroyo, who escaped the fourth without further damage. Red Sox 7, Cardinals 5. All was calm for a couple of innings until the error bug hit the Red Sox again. Arroyo was cruising when So Taguchi chopped a grounder down the third-base line for an infield single. Arroyo, who had retired the last six batters at that point, tried to turn an impossible play and launched a throw well wide of first base, putting Taguchi into scoring position. Two batters later, the game was tied. 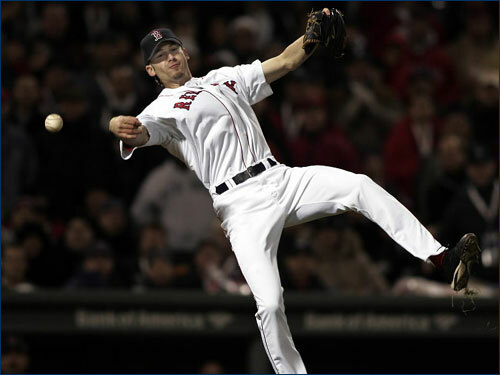 Though it’s hard to remember now, the feeling in Boston at that moment was close to panic. So many times, for eight decades, the Red Sox had thrown away opportunity after opportunity. Fenway’s excitement over hosting a World Series game for the first time in 18 years was muted harshly by the Cardinals’ comeback. St. Louis had been the best team in baseball all year, winning 105 games and featuring a potent lineup with Walker, Albert Pujols, Jim Edmonds, Edgar Renteria and Scott Rolen. The pitching staff was also incredibly deep. Jeff Suppan, Chris Carpenter, Jason Marquis and Matt Morris all won 15 games or more, and Jason Isringhausen converted 47 save opportunities. The Cardinals were scary. After six innings of heart-wrenching baseball, St. Louis was even scarier. But while fans may have feared the Cardinals, it was clear the Red Sox didn’t. Manny Ramirez got Boston back on top with an RBI single in the seventh, and Ortiz ripped a hot shot that caught second baseman Tony Womack in the clavicle. Another run crossed the plate, and the Red Sox held a two-run lead with just two innings remaining. Terry Francona sent in a pair of defensive replacements — Mientkiewicz to first, Gabe Kapler to right — but it turned out to be one too few. With two outs and a runner on, Renteria singled to left. 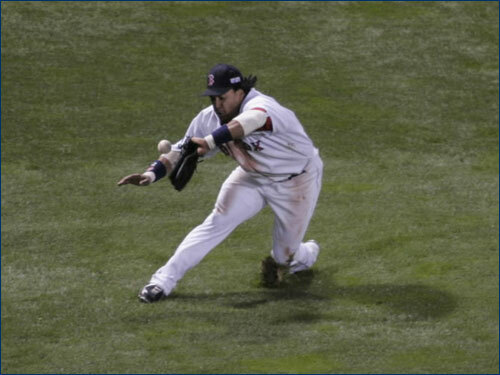 Ramirez misplayed the ball, allowing Marquis (who entered the game as a pinch runner) to score. In came lights-out closer Keith Foulke. He got Walker to hit a low liner to left field, but Manny misplayed his sliding catch attempt, allowing the tying run to cross the plate. And once again, the feeling of impending doom set in throughout Fenway. Foulke then intentionally walked Pujols to load the bases with one out. With the game on the line, Foulke induced a Rolen popup before sitting Edmonds down with a fastball on the inside corner. With Dave Roberts — the ALCS hero from Games 4 and 5 — on the bench, it’s easy to say those plays would have been made if he’d been a defensive replacement. But given the back-and-forth nature of the game, Francona could not risk taking his best bat in Ramirez out of the lineup. So with the stage set for either a dramatic win or a devastating loss, the Red Sox needed one of their big boppers to step up. Or their soft-hitting second baseman. But before that could happen, the Cardinals returned the favors of Ramirez with an error of their own. Edgar Renteria couldn’t handle a routine groundball off the bat of Jason Varitek, and instead of a two-out, bases-empty situation, Julian Tavarez had to face Mark Bellhorn with a runner on base. Just a week earlier, Bellhorn had been booed in Boston for being mired in a horrific slump and looking lost at the plate. Fans shouted at Francona to play Pokey Reese, if for no reason than his spectacular defense. But Francona stuck with his man, who eventually hit crucial home runs in Games 6 and 7 at Yankee Stadium. So when Bellhorn strode to the box for his eighth-inning at-bat, his confidence couldn’t have been much higher. Tavarez, on the other hand, surrendered a pair of homers in the NLCS and broke his hand afterward in a fist fight with a dugout telephone. With the two men in the same infield yet in completely separate worlds, Tavarez got ahead 0-2. Bellhorn was as patient a batter as Boston had ever seen, but his at-bats ended with a called third strike much too often for anyone to believe this one would end any differently. Naturally, everyone’s thought process went to the ninth. Johnny Damon and Orlando Cabrera were due up, with Manny and Ortiz set to follow. If Foulke could just gut out another inning, Ortiz would be able to add to his postseason heroics with another walk-off. Just one more inning. But, of course, that wasn’t necessary. Bellhorn applied his short stroke to an 80-mph breaking ball over the heart of the plate and launched a ball down the right-field line. Boston froze as Bellhorn slowly trotted toward first, leaning ever so slightly to his left. Unlike Ortiz’s first-inning blast, no umpire was necessary for this one, as the ball hit squarely off the foul pole. When the ball bounced back onto the warning track and the ring of the pole resounded throughout the park, Fenway erupted, once again believing the World Series belonged to Boston. Instantly, there were thoughts of Carlton Fisk‘s legendary homer in 1975. Bellhorn refrained from the waving and the jumping, but it turned out to be an even more important home run in Red Sox history. What Bellhorn — and later Foulke, who as Boston’s postseason pitching MVP struck out Roger Cedeno to end the game — accomplished was, in the strictest sense, win one baseball game. But the significance of that one win can’t be understated. One win for the Cardinals, and the tables would have been turned. Conversely, one loss for the Red Sox, and the nerves of New England would be on edge. Thanks to Bellhorn’s home run, the world — or at least the World Series — was saved. The rest of the series seemed elementary, with the Red Sox winning 6-2 in Game 2, 4-1 in Game 3 and 3-0 in the series clincher. It’s been easy over the last five years to look back and say that there’s nobody that could have beaten that Red Sox team, that destiny was on their side, that fate and fate alone determined that World Series. Maybe it was fate, but if the Cardinals had taken Game 1, would history have been different? Fortunately, the Red Sox never had to find out.